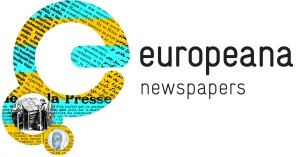 The Friedrich Teßmann Library (LFT) decided to structure the Europeana Newspapers Information Day into two separate but contiguous events with different goals and targets. The first event was held within the context of the South Tyrolean Day of Libraries scheduled on Saturday 25th of October. 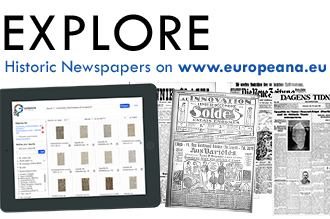 Main goal of the event was to highlight the interest of online digitised newspaper collections and to offer low-threshold information about interesting historic content on local and European level and how to search for it, structured in 5 activity stations. The event was open to everybody. The second event was a Specialists’ Meeting Day on Monday, 27th of October, aiming to bring together German, Austrian and Italian experts to outline the current state of the art of digitisation and illustrate different approaches in the European countries. The targeted audience was personnel in charge of digitisation within Libraries and Archives as well as any operator dealing with digitisation projects. 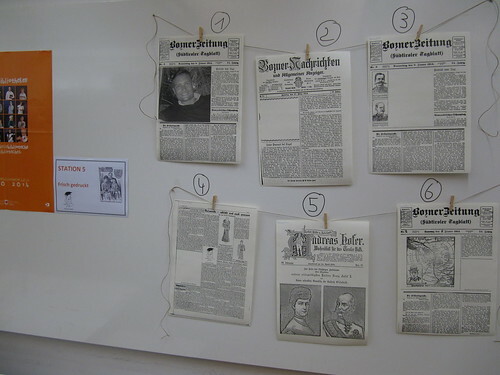 Within the Day of Libraries, LFT organized an event under the motto “Hot from the press – breakfast with historical newspapers”, aiming to attract not only regular library users. The event was structured in 5 activity stations following the key principles of participation, action and entertainment. All stations were attended by a library staff member and could be visited in free order. At the information stand on a big screen, different Europeana information material like the Europeana Newspaper animation and Europeana Newspapers presentation slides has been shown in a loop. Every hour a project collaborator gave a short introduction to the main objectives and results of the project. At Station 2: Historic Newspapers to touch, original historic newspapers were displayed. White gloves were provided to point out the fragility of the material. A library staff member gave some rules for handling the originals and basic information about the exposed issues. 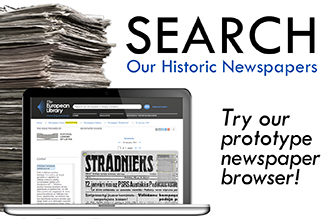 On a tablet it was possible to browse the same newspaper issues by using the TEL browser. At Station 3 The European Library Work Station – not only local newspapers, the default setting on the library computers, which usually is the library’s catalogue, was the European Library newspaper browser. 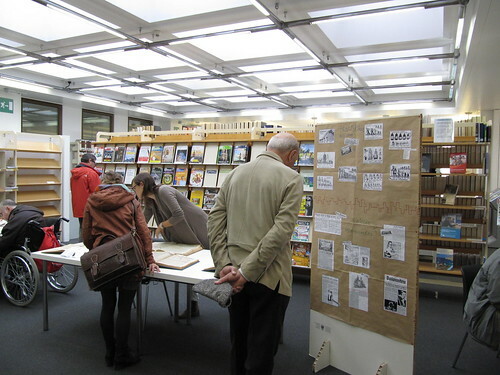 Visitors were invited to browse the newspapers of different countries and to check out the different search options or to try the full text search by keywords. Being a Saturday morning, the visitors were offered a small breakfast at Station 4: Hot from the press I, a cup of coffee, a freshly pressed orange juice, croissants or a slice of „newspaper cake“. At Station 5: Hot from the press II, visitors had the opportunity to have their own picture printed on a historic newspaper front page, choosing from different samples. 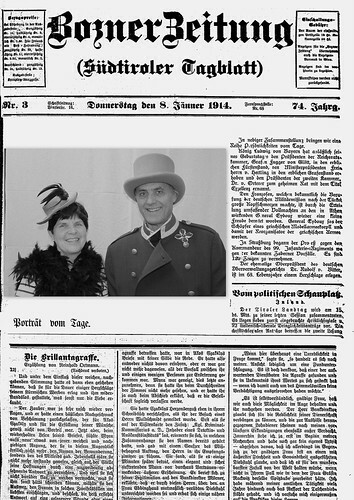 An instant picture taken of the visitor, completed by some „historical“ props and costumes as hats, furs or feather boa, was placed on the chosen newspaper page, printed and handed out. At the end of the Information Day, about 200 visitors were counted. Most of them were regular library users, but also a great number of “new” public attended the library and the response was more than positive. At the specialists’ Meeting day held on the 27 of October 2014, 9 experts from 4 countries (Germany, Austria, Italy, England) spoke about the complex topics related to the enhancement of digital newspaper collections, such as refinement techniques, semantic enrichment and research, visualisation of information and digital long-term preservation. The day started with general information about the Europeana Newspapers project, provided by LFT director Johannes Andresen, who gave an overview of the project’s partners, aims and objectives. Next on the agenda was key note speaker Dave Thompson from Wellcome Library, London, with a generic view about things to do (and to avoid) when starting a digitisation project. He talked about the importance of creating sustainable processes and the need to ensure that digitisation is considered as a fully inclusive end-to-end process. 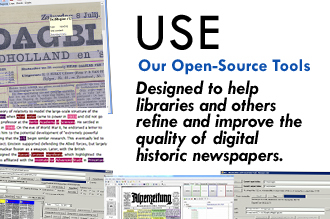 He was followed by Günter Mühlberger from the University of Innsbruck, entering in the complex topic of Optical Character Recognition, which is a must for digital collections if we want to access, link or work with the content of historical newspapers. Mühlberger gave an overview on today’s available software solutions and pointed out the need of post-processing of OCR results. He underlined the importance of structural recognition of newspapers, where new approaches beyond article separation are needed, i.e. the recognition of different content units, as obituaries, continued novels or advertising, as a source of unique content that cannot be found elsewhere. This led to the next speaker, Michel Genereux form EURAC, Bolzano, who is actually working on the attempt to automate the procedures for correcting faulty OCR-ed text by use of computational linguistic methods. Clemens Neudecker from Staatsbibliothek zu Berlin (Berlin State Library) talked about the importance of Named Entity Recognition (NER) and Europeana Newspapers project great efforts to enhance the software for NER developed by Stanford University to make it suitable for a multilingual and library context. The focus of the following speakers was all on Italy. Patrizia Rossi introduced the audience to the efforts made by CSI-Piemonte, the Information System Consortium to which Piedmont’s Public Administration entrusts the management and implementation of its ICT services, in building a Digital archive of journalistic information. Heart piece of the Digital Archive is the Historic Archive of ”La Stampa”, a daily newspaper published without interruptions since 1867. Andrea Bolioli from CELI, Torino, gave more tecnical insights about search functionalities, facets and visualisation of content, i.e. the creation of time graphs to visualize the frequency of a search term in a certain time period. In the afternoon session, Maurizio Messina, director of Biblioteca Nazionale Marciana in Venice, gave an introduction to long term conservation of digital objects. He emphasized how preservation is an expensive and tricky thing to accomplish individually, that needs a centralized organisation with the help of e-Infrastructures including cloud and grid systems. Messina presented”Magazzini Digitali”, the Italian legal deposit service for digital resources promoted by the Italian Ministery of Culture (MIBACT). Messina was followed by Andrea Marchetti, researcher at the Italian National Research Council (CNR). His lecture was focused on visualisation methods and the way big data material can become more understandable using visual encoding as maps, graphs, timelines, word clouds, charts or infographics. The Meeting Day ended with an outlook on the changing meaning of the idea of ”collection” in the digital age and the future ”hybrid library” given by Klaus Kempf from Bayerische Staatsbibliothek in Munich. The most outstanding changes are the transition from the concept of ownership to the one of access, the growing importance of open access and a much more wider understanding of what collection means, including all sort of media, from print to electronic to online resources. The experts’ Meeting Day saw 110 registered participants from every sort of memory institution (with a small part of presence of digitisation service providers), taking a chance to learn more about the digitisation work flow that follows the scanning process. The goal to bring together experts from Italy and the German speaking neighbor countries has been fully successful. This entry was posted in Information Day and tagged Friedrich Tessmann Library by eurnews. Bookmark the permalink.